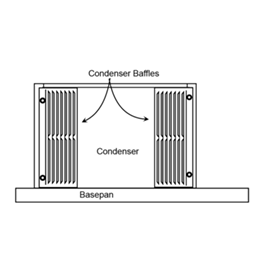 Includes 2 air-deflection baffles that can be mounted on the condenser coil to direct air toward the center and away from the inlet. This prevents the re-circulation of hot condenser air,maintaining unit cooling and heating capacity and unit efficiency. Use the baffles when an older unit is being replaced and when the existing grille does not have deflector baffles. Any existing baffles must be removed to install this kit.